Ryan Kilgore and Liz Wallner, two of the members of the NC State Sustainability Fund board, announce the 2017-2018 winners of grant funding during the Celebration of NC State Sustainability event on April 20. 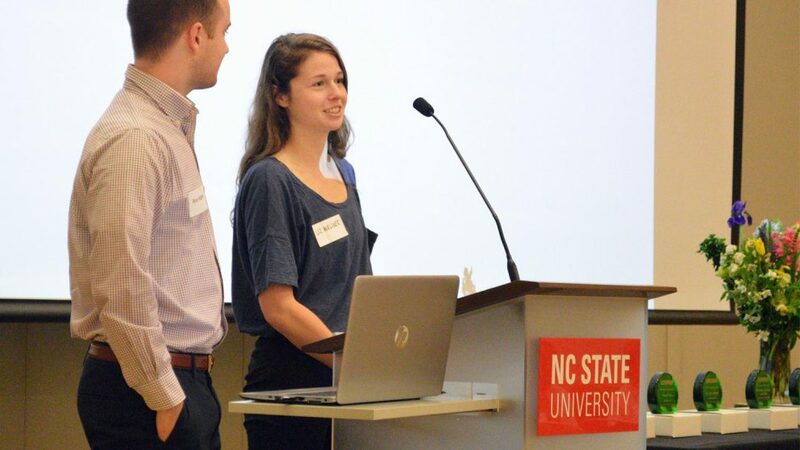 Students Ryan Kilgore (left) and Liz Wallner, two of the members of NC State’s Sustainability Fund board, announce 2017-2018 winners of grant funding during the Celebration of NC State Sustainability event on April 20. Thirteen sustainability projects will be implemented on campus over the next year thanks to $179,000 in grants recently awarded by the student-led advisory board of NC State’s Sustainability Fund. Generated by a $2.50 per semester student fee that students voted to create in 2012, grant funding is available to NC State students, faculty and staff who submit proposals for sustainability projects that improve campus or promote awareness. “This is the fourth round of projects funded by the Sustainability Fund and is our largest disbursement of funds yet. The impacts of the Sustainability Fund continue to grow as it provides feeder dollars for innovation,” said engineering student Ryan Kilgore, who chairs the fund’s board. “I hope the Sustainability Fund will continue to grow so it can increasingly deliver unparalleled and unique opportunities for students while improving campus with cutting-edge installations and modeling the way for our peer institutions,” Kilgore said. Updates on previous projects funded by the Sustainability Fund are available at go.ncsu.edu/sustainabilityfund. Published in News, Newswire, Students, Uncategorized.